A couple of weeks ago we found a dining table on Craigslist that fit what I was looking for, extra leaves and nice thick, sturdy legs :o) I had contemplated finding a table that I could replace the top with planks of wood but decided a table with removable leaves would be better for our small dining room, it would give us the versatility to sit more people if family or friends were visiting. I refinished the table to match the dining room chairs I had worked on a while back. I decided to keep the top wood visible but painted the legs a light blue to match our chairs. To finish the table was a quite a process. 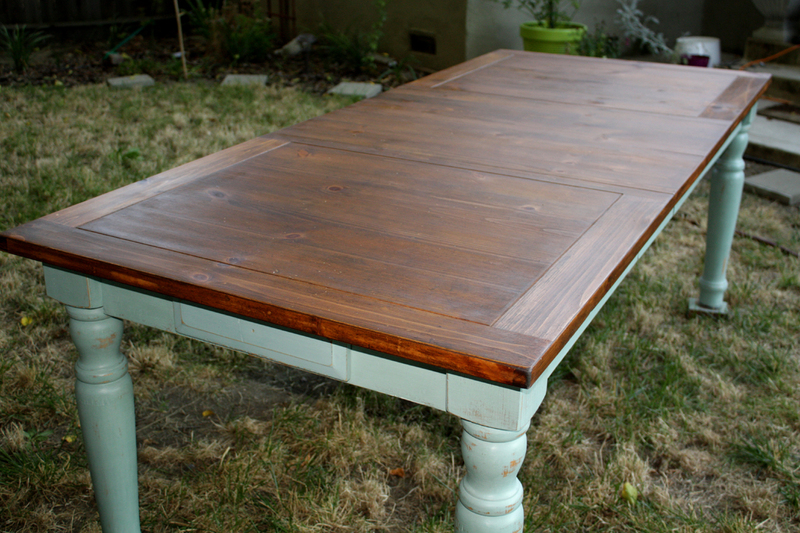 The table I believe is made of pine (or some light colored wood) and had a coat of varnish. The varnish had been worn through in some places, as Brian remarked, it looked like it had been a kids crafting table. So my first task was to strip the varnish from the table top. I didn't worry about the legs and sides because I was planning on painting those parts. I bought some citrus something or other stripper (I can't remember the name, it is orange goop that is supposed to be more eco-friendly than other stripping products). I slathered it on somewhat thickly and waited a half hour for it to do it's job. I used a plastic scrapper and some (A LOT) of paper towels and got to work scraping off the orange goop and varnish. Here is a picture after a round of stripping, I forgot to take a before picture but this pretty much shows what I started off with. Next, it was on to the staining. I wanted to make the surface look a bit old and weather beaten, greyish-brown in color like an old fence. I found some stain from Minwax in a "Medium Walnut" that I thought would do the trick. I used an old rag to apply the stain, and the wood sure soaked it up. I decided to lightly sand in between stain applications as I heard that brings out the grain of the wood. 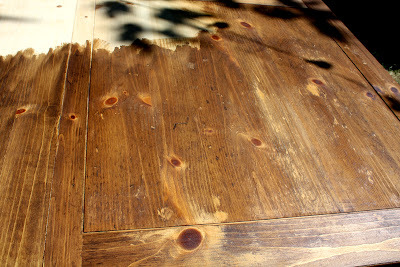 Then it was on to another round of stain..............and this is when all heck broke loose! What happened to my beautiful table?! I think this is another result of not getting all the varnish off when stripping, leaving me with patches that where not able to take up the stain. I felt a little defeated. I was ready to throw in my crusty stain rag and paint the top! But I decided to give it another try. 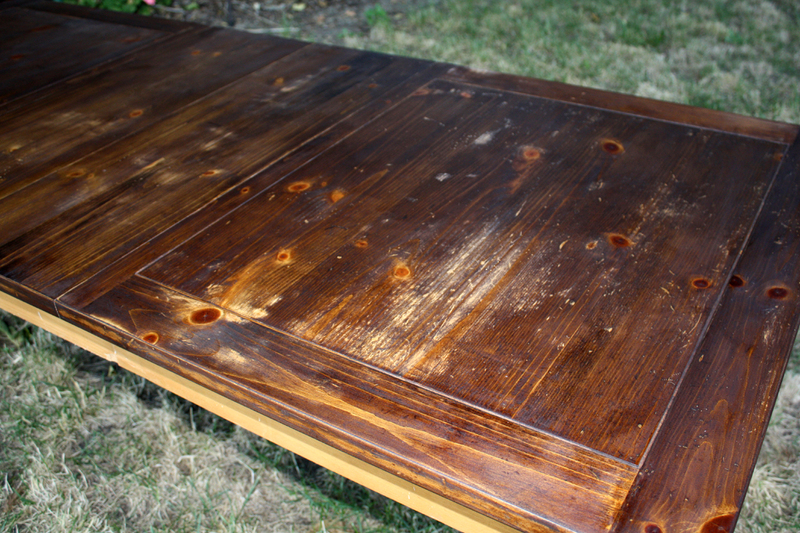 So I got my stripper back out and coated the whole table top again, laying it on extra thick in the splotchy areas. I scraped off what I could and sanded again. AH, RELIEF! I then added some stain but in Minwax's "Colonial Maple", a slightly red tint, as two applications of the "Medium Walnut" were too dark for me. 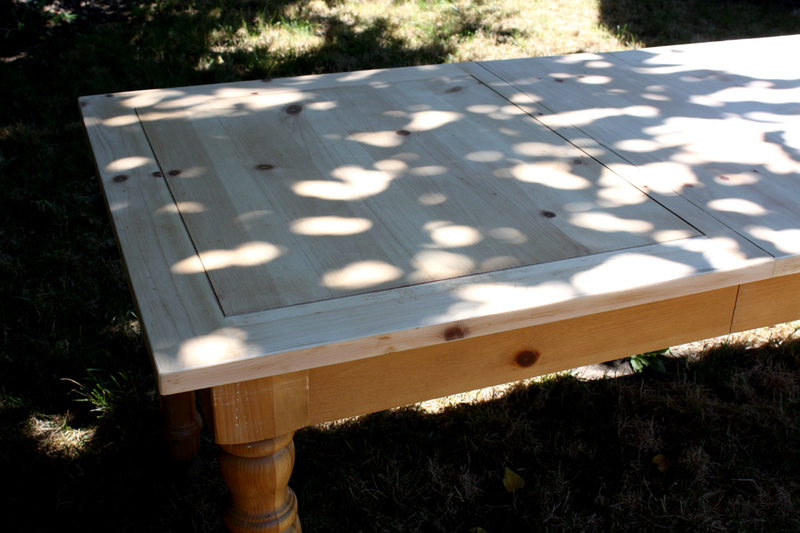 Then it was two applications of Minwax's Tung Oil to protect the surface and the top was finished! 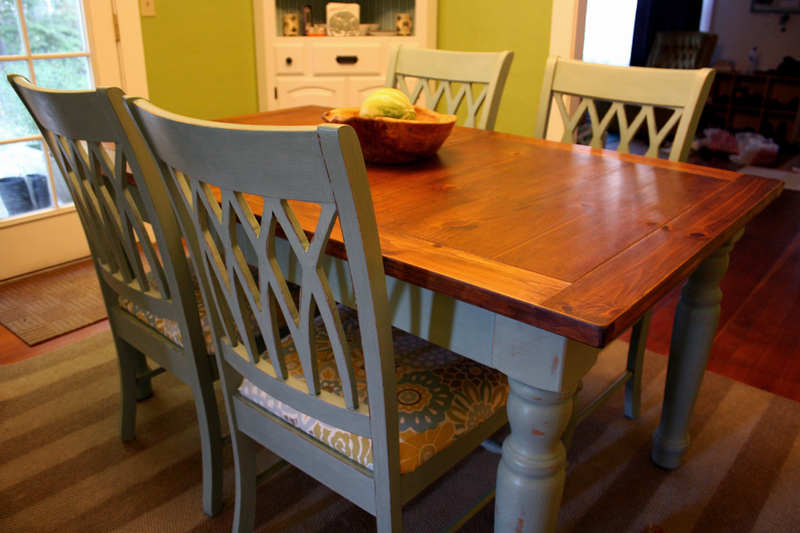 I painted the sides in Annie Sloan's "Duck Egg Blue" to match my dining chairs, did a bit of paint distressing and finished with a layer of wax. Gorgeous if I do say so myself. Especially after the staining fiasco! With the two leaves in, the table is sooo loooong! And look at the nice, thick sturdy legs! Yes, with few battle scars, but only superficial! And it even has a cute little drawer (I still need to replace the knob). Lastly I removed the two leaves for everday use in the dining room. Even those citrus strippers give me the heebie-jeebies nowadays. I'm now a fan of plain old sandpaper for removing the varnish. So far, so good (knock wood)! I love the wood top and painted base. It's definitely a keeper! 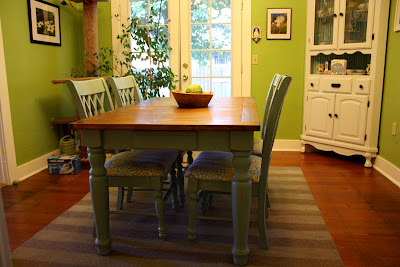 Your table is beautiful and I love the fabric you used on the chairs. 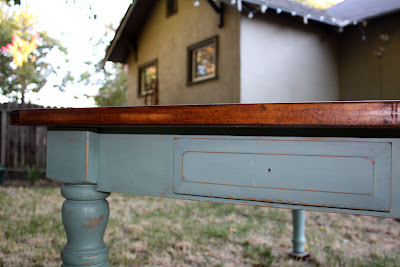 I just had my own hiccup on a table staining project(my very first)and I was ready to call it quits. I ended up taking the table to Rockler (it's a wood hardware store) and they were so helpful. 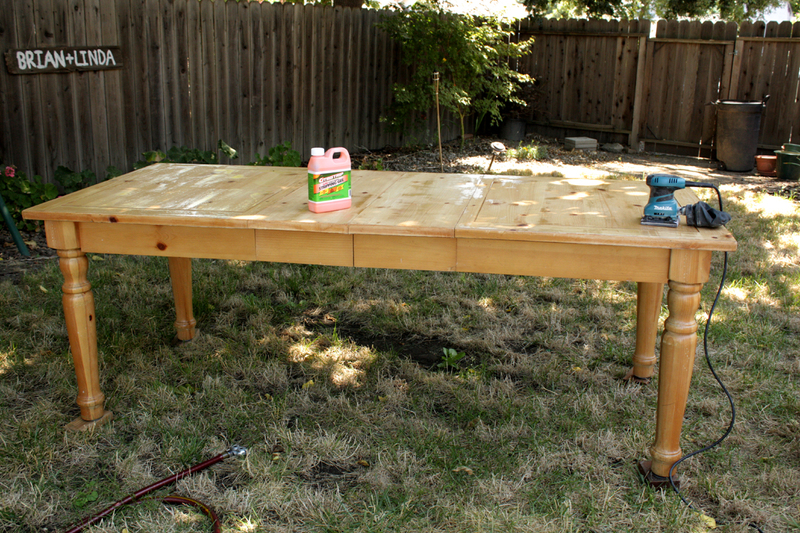 They told me I just needed to resand it and they swayed me away from the Minwax stain. I am so glad they did, they suggested I used General Finishes Gel Stain. I couldn't believe the difference in the two stains. Anyways if you end up doing another restain project you have to give it a try! I hopped on over from Miss Mustard Seed, have a great night! Thanks for the comments and for the tip! I'll definitely have to give the General Finishes stain a try, I'm sure I'll be restaining something again soon. Thanks for stopping by my blog! You did such an amazing job on the table AND the chairs!! I loved them so much I featured them today in my Friday I'm In Love favorites! Hi there... can you tell me what adding wax at the end does? I have heard a lot of people say they use it but I am not sure why?? Thanks for the comment! For me, I use wax because the chalk paint alone when it dries is chalky as the name implies. It's perfect for sanding the paint to distress it but I'm not sure how well the finish would hold up without a protective layer. Also the wax darkens the color a bit and adds some shine which I like. The one downfall I've found after applying the wax to chalk paint is that you can see the brush strokes. I'm not sure if other people have this problem but I've come across it with both my chairs and table, it could be the wax I'm using since it's not the Annie Sloan wax. 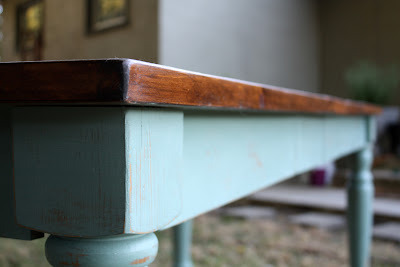 If I wasn't going to distress the finish I would probably use a latex paint, but the chalk paint is also nice because you don't have to prep the surface before you paint (sand, primer, etc). I hope that helps! Thanks again for stopping by! The dark top is stunning. Nice color choice as well. That is so beautiful Linda! It turned out great and I really love the chairs, too! Yeah! I just found your blog because I'm trying to figure out how to seal a table I just got off of cl. The only difference...I'm not staining at all. I just sanded it down and want to seal it. 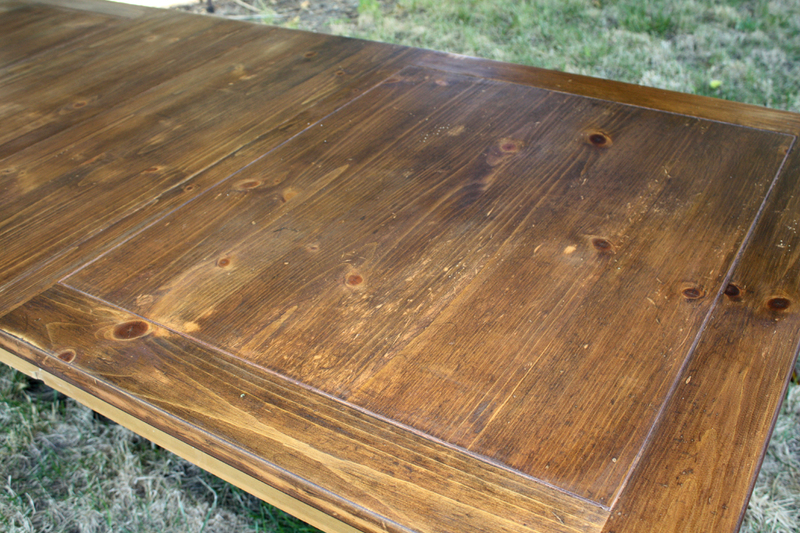 What do you think of the Tung Oil? I've heard wax would work too...I'm not sure what route to go. Any advice? Thank you! Ok...the craziest thing just happened!!! My sister sent me a link to your blog yesterday, because she knows how much I love DIY projects, especially thrift store/garage sale finds and the whole trash to treasure process! Anyway, I stumbled upon your blue table and chairs here and just love it! I love the chunkiness (is that a word?) of the table and the lattice detail of the chairs...love it all!!! In a totally random "let's see if there's anything on Craigslist (keep in mind, I already own a dining set...two actually, one in the kitchen and one in the...dining room...) ... Well, lo and behold, I found the EXACT chairs (6 of them including two armchairs...just what I need for our family of 6) plus almost the exact table for $100 right around the corner from my house!!! Im so excited!!! Now I've just got to sell the table and chairs I currently have in my kitchen...I'm so excited...I'll send you pics when I get the set today. :) my husband just looooooves my hobby!!! Lol. Thanks for the detailed tips...it'll come in handy for sure!!! Awesome find! 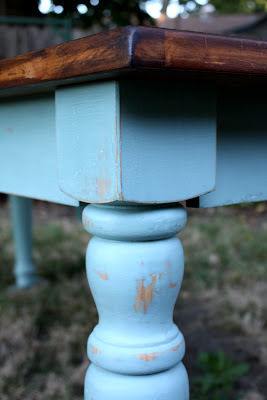 I used Annie Sloane's chalk paint and with her paint you don't have to do any of the prep work (sanding, priming, etc.) But if you are using another type of paint you will have to include those steps to make sure the paint adheres. 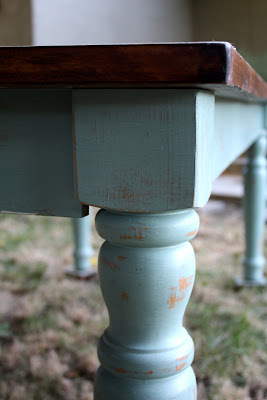 The chalk paint is also really nice if you want to do any distressing as it comes off as a powder with sanding rather than the peeling you get with latex paint. I'm glad your sister sent you a link to my blog! Happy DIYing! I think I'll go ahead and get the chalk paint. How much do you think I'll need? I bought a quart and that was enough for the table base and the four chairs. I still have some paint left over so that would probably be enough for the extra captain chairs that you have. Good luck, have fun! i have that same print from your chair cousions as floor to ceiling drapes! please tell me the color you used for the blue-ish color. 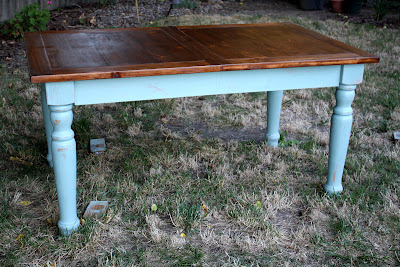 it would be so perfect for my table re-do with that matching print! The color is "Duck Egg Blue" in Annie Sloane's chalk paint. Thanks for stopping by my blog and good luck on your table!